Latest version: 2017-07-03. Compatible with iPhone, iPad and iPod Touch (no Android version available). We pray Android and Windows Phone users to please forgive us for not finding the time and budget required to develop our apps for other systems. Pictorial guide of Antiparos, sister island of Paros, in the Cyclades (Aegean Sea), featuring embedded maps, useful information, a lot of photos, and all points of interest including beaches and utilities. 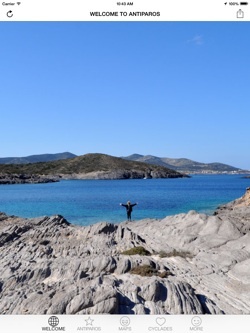 Antiparos is getting the mix that transform a lost island into a trendy destination... Don't wait! To use this guide, you don't need to be connected, except to get a route. It is fully iPhone compatible, but to get the best of it you should use it with an iPad! 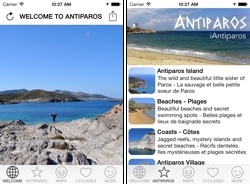 It features photo galleries and slideshows of the most beautiful spots of Antiparos (including beaches), activities suggestions, and detailed maps. This guide is part of the iCyclades Free iOS Apps Collection produced by fusions.ch, a series of free guides made by travelers for travelers. To plan your trip to Antiparos and get the best of your stay, we recommend to get these guides too: iParos (all about Paros) and iCyclades (general info, climate, travel, gastronomy, oenology, and more). 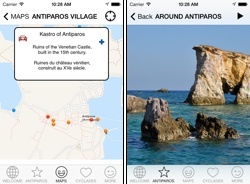 More free apps focused on the Cyclades are also available in the same collection: GreekMaps, iSantorini, iMykonos, iNaxos, iSyros, iAndros, and iTinos.